Everyone needs their sleep. Good sleep reduces stress, recharges and repairs your body, makes you more alert, and just makes you feel good. For most people an average of seven to nine hours on sleep is fine, but everyone is different, some need more and some need less. If you are having troubles falling asleep or just getting a good night’s sleep it can have negative effects on your daily life. There are many things you can do to help yourself fall asleep faster, and stay asleep. Your daily routine makes a big difference in your quality and quantity of sleep. First, make sure your bedroom is conducive to a good night’s sleep. • Keep the bedroom quiet. You may need to use something to mask the noise like a fan, a CD of your favorite soothing sounds, soft music, or just white noise. Make sure your bedroom is dark. Use dark heavy curtains or wear an eye mask if needed. • Keep your bedroom cool. Most people sleep the best when the temperature is around sixty five degrees Fahrenheit. • Make sure you’re comfortable in your bed. You may need to try soft, firm, and in between mattresses to see which one is best for you. An adjustable bed that can change the firmness may also be an option. A memory foam mattress topper might also work for you. Try out some of the many different pillows that are now available. • Use your bed as a bed. Use it for sleeping, don’t use it to watch television, work on the computer, or do other things in bed that it’s not intended for. By doing this you can teach your brain that when you’re going to bed, you’re going there to sleep and nothing else. Second, set up a schedule for yourself. Set a specific bedtime and time to get up in the morning. Start by picking a bedtime that you think is appropriate, and go to bed at that time. In the same way, wake up in the morning at the same time. If you still feel tired in the morning or throughout the day you may need to set your bedtime a little earlier. Although, if at your bedtime you are lying in bed and not falling asleep you may need to extend your bedtime. By experimenting with these times you will find a plan that works for you. After you have found your optimal sleep times, you need to stick with them. Go to sleep and get up at the same time every day, even on weekends. This will get your body into a sleep routine. If you do stay up too late on a weekend, still get up at the same time the next morning. You can catch up on sleep the next day by taking a short thirty minute nap in the afternoon. Make sure you take your nap before five PM or don’t take it at all. Napping too late in the day will make it hard to fall asleep at bedtime. To help fall asleep quickly exercise during the day, but not too close to your bedtime. Stay active after you have eaten dinner, if you find yourself getting sleepy after your meal. Falling asleep too early will have you waking up in the middle of the night. Even just napping after dinner will give you problems at bedtime. Don’t eat or drink two hours before going to bed, especially rich foods, alcohol, and caffeine. Eating makes your body work to digest the food while you are trying to calm down and go to sleep. Drinking too late may have you up during the night to go to the bathroom. Relax before going to bed. Try relaxing techniques you may find online or in books. Take a hot bath and release your stress. Visualize a peaceful place, and put yourself there. Use deep breathing exercises also found in books or online. Once you get to bed, find your peaceful place and relax. Don’t think about what happened that day or focus on what needs done tomorrow. Don’t watch television in bed, it stimulates your brain and has noisy commercials and constant flickering light. Don’t worry about getting to sleep, what time it is, or how much time you have until you have to wake up. Just relax and soon you should be sleeping. If you’re still having trouble getting to sleep or you’re waking up in the middle of the night remember to think about relaxing in your peaceful place and try some deep breathing. Give yourself some time in bed. 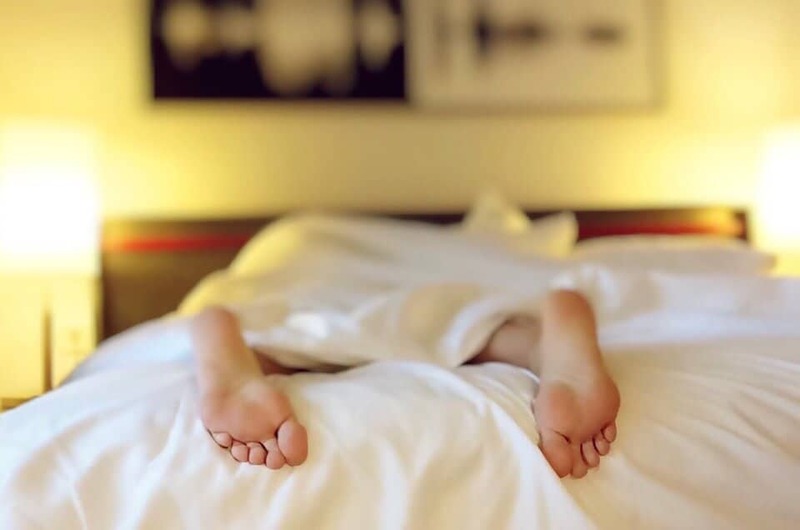 If after twenty minutes you’re still not sleeping, get out of bed and do a quiet activity, drink a warm glass of milk (this actually does help soothe your nervous system), drink some hot herb tea, or do your relaxation techniques. Overall, don’t give up. Stick with it and follow through with your bedtime routine. Keep with your routine and you will be falling asleep more quickly, sleeping through the night, and waking up in the morning refreshed. Don’t quit, you may be surprised at how much better you will feel when you start getting a good night’s sleep every night.